The new Urban Decay 15 Year Anniversary Eyeshadow Collection* offers fifteen new shades, that’s one for each year they’ve been around. Fifteen years huh? I wonder when they launched the brand to the UK market? I can probably remember back to around 2005/6 but don’t quote me on that… as I think I’ve said before, it was their nail polishes that used to catch my attention back then. Anyway, 15 years… 15 new shades. Let’s take a closer look at them. 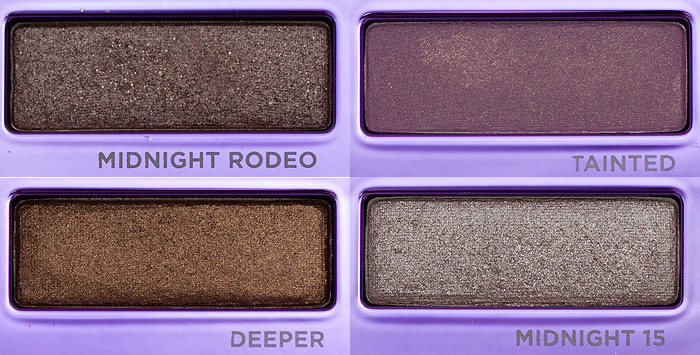 As far as the range of shades go, I think Urban Decay have taken a good line with this palette. They seem to have placed a focus on the usable, a term which shouldn’t be confused with neutral. However it may suffer from being a little non-commital, I’ve already heard grumbles from neutral-lovers saying that it reminds them too much of the Naked Palette (I guess there’s only so many variations of Bronze out there) whilst the brights fans may feel a little ignored with this release. 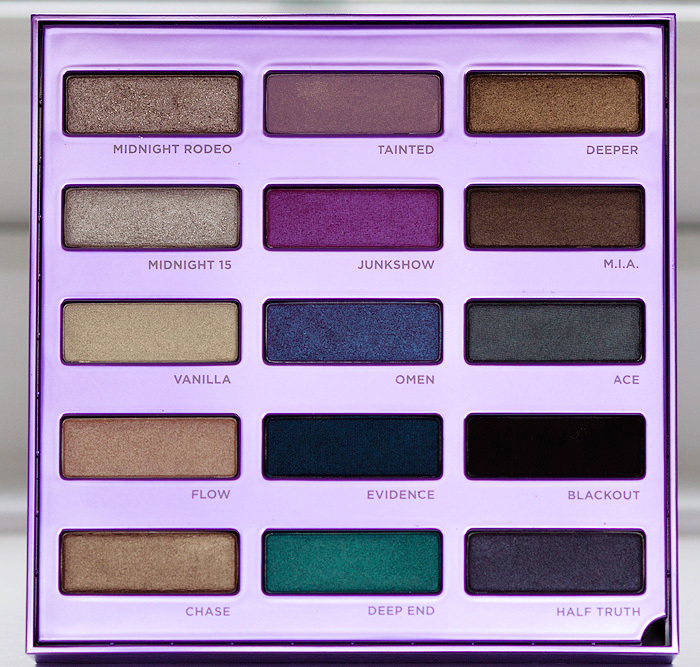 I’ve also read a couple of grumbles that there are no mattes in this palette which I have to agree is a real shame as Urban Decay have released some incredible and under-rated matte shades over the years. Before swatching (my opinion may change! 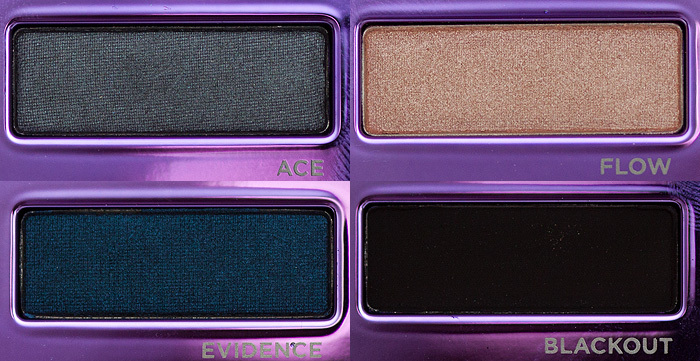 ), the initial stand-out beauties for me are: Tainted, Midnight 15, Ace, Evidence and Half Truth. I hope they don’t disappoint. Swatches tomorrow but in the mean-time… Best shade there? How about the worst? Oh, aren’t you evil showing us this palette layer by layer 😛 Gimme the swatches now!! Actually don’t…I’m way too tempted by it as it is! I’m loving evidence, tainted, half truth and deep end…the list could go on! OMG that is beautiful I must have it..aargghh!!!!! I have already purchased this as the colours are great. Would also like another bright pallette like the Deluxe – easily still my favourite. NOW look what you did I got the palette and two of th new liners and they gave me a mini PP and a lipgloss too ……. I’ve ordered the palette and I’m impatiently waiting for it. 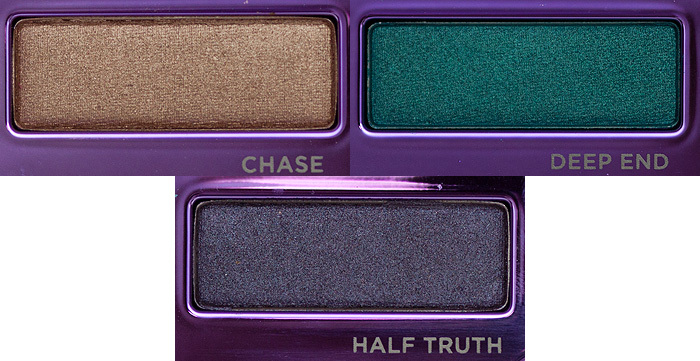 I would say my favourite shades are ACE, EVIDENCE, HALF-TRUTH and JUNKSHOW. Heck I like them all. I CAN’T WAIT!!!!! and I can’t wait for your swatches tomorrow…. For me Midnight Rodea is just another MC(RA), pretty shade, but awful glitter fallout. Glitter was all down my face when I wore it. My favourite shades are the ones down the middle (Tainted less so though) and also Deeper, Half Truth, Vanilla and Flow. Your descriptions are ace. I love the look of *deep breath* Omen, Ace, Evidence and Deer End. Your photo of ‘Tainted’ looks darker than mine in the palette :S its more of a light pale baby pink, but it looks purple on your photo, I wonder why!? Here is the picture of it on my palette. How odd because UD’s official description of it is: “pale matte purple with golden shimmer”. Eek, God knows why yours is pink! Urban Decay and their limited edition collections are so beautiful, its just not fair. 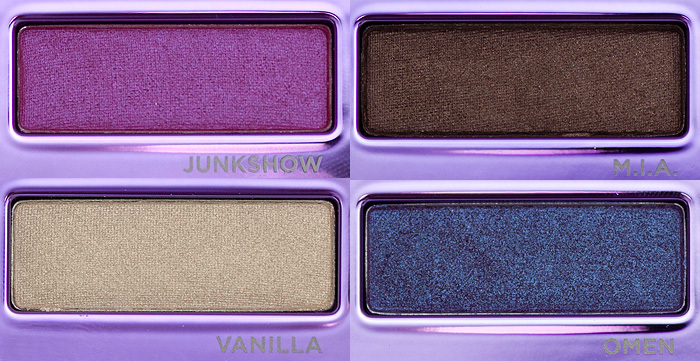 I swore to myself I was done with palettes until I saw this – now it is on my must-have list. Laura Geller Air Whipped Bronzer whips me up the perfect shade!